On a sale on GPS-auctions I bought a son to "Maximus". 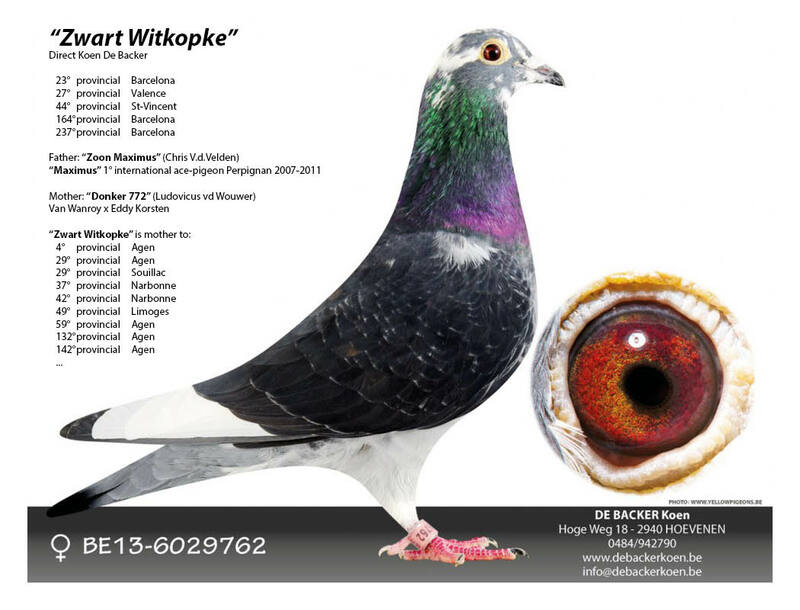 This top performer was 1st international ace pigeon Perpignan 2007-2011. This son was in my breeding loft since 2013, and in 2014 a daughter to him won 1:10 on St Vincent, 288th national 3142 pigeons. As 2y old, I raced her on Barcelona with expectation, but onfortunately, She only arrived on Sundag at 5h00 when I woke up. The was clocked at 05h04, good for a price 1:4. It was only a bit later that I've seen she was wounded and lost feathers in her wing. She showed some caracter to got home. The wound was already dry, so maybe she was flying a lot of km's with that wound. In 2016 I've raced her again. 27th provincial Valence, clocked at 05h00, raced in de dark.... She also won her price on Barcelona. In 2017 she had to race Barcelona again and won the 23th provincial (207th national). Clocked in the dark again, 23h12. 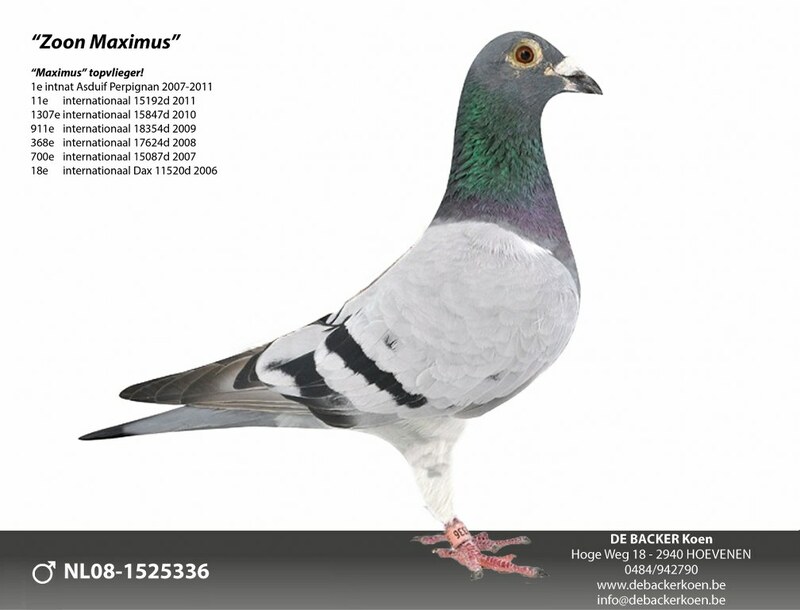 Unfortunately "Son Maximus" is nog longer in the breeding loft. He was no longer fertile, that's why he was removed. I lost to much time with him. Every time I lost 2 youngsters and a hen of which I didn't have youngsters of. 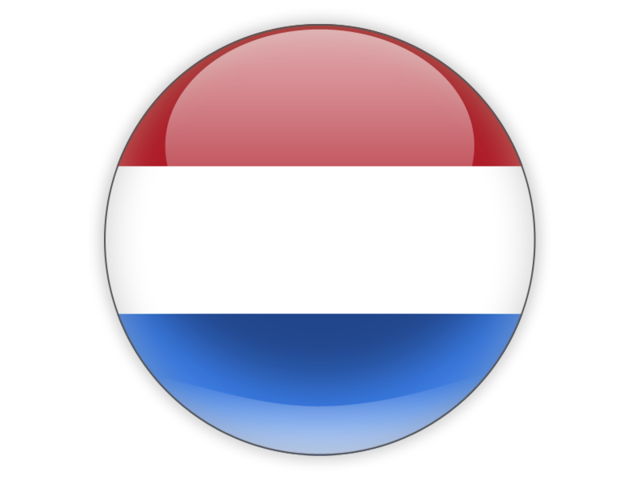 Because I don't race hens anymore in 2018, "Zwart Witkopje", 3/3 on Barcelona and some other good prices, will reproduce her genes in the breeding loft.